His school visits are dynamic, inspiring, and creatively structured for each individual grade level. T. E. Watson is an award winning children’s author, columnist in the US and Canada, speaker, philanthropist and last but certainly not least a Scotsman. His career has spanned the many aspects of the publishing industry. Having started by accident from the efforts of some 35 6th graders (he was a teacher), his writings have taken readers to worlds they can revisit again and again. From his most recent travels back to Scotland in The Man Who Spoke With Cats and his best selling Glen Robbie: A Scottish Fairy Tale, to the popular educational and historical pioneer series Going West, his readers keep coming back for more, wondering to which magical land he is going to take them next. He is the author of some 130 stories and now 5 new audio book productions and 12 new books being completed for children... and he says he has slowed a bit! With over 40 years in the writing world doing everything from reporting to writing for magazines and technical manuals, to political essays for national, as well as environmental issues. He has also penned many Guides and teaching curriculums for schools throughout the country. He has written adult works, and even horror, but his first love will always be the Children’s genre. His research and studies in Literature of the U.K, with a focus on Children’s Writers, with a more focused study of Robert Louis Stevenson earned T.E. the very prestigious FSA Fellowship from the Royal National Museum in Edinburgh, Scotland in 2003. T. E.Watson has in his past been a President of The Northern California Publishers and Authors, is a member of the SCBWI Society of Children’s Book Writers and Illustrators, member of the California Writers Club, as well as many organizations overseas. He is very active in his Scottish organization community and is determined to never retire from writing for children. With more and more coming he is presently working on his final rewrites of two chapter book trilogies for children, and being recently commissioned to write two “how to” books on writing and marketing. His pet project is a book for authors Presenting Successful School Visits. Having become known as the Guru of School Presentations his reputation for motivating and making reading and writing exciting has earned him great acclaim all over America. He is available for further speaking engagements as well as visits to schools. He also mentors and coaches writers part time when he has breathing space! Internationally appreciated author of children’s books and school presentations, TE.Watson became known as the “Imaginician” because of his ability to combine imagination with technical know how (technician) with a hint of magician included, which he adeptly shares with children, empowering them to discover their own unique imaginician. His school visit are dynamic interactions with the students where he creates inspiring, engaging dialogue and activities creatively structured for each individual grade level. The children leave these assemblies or classroom workshops far more passionate and excited about reading and writing than ever before. Readers , no matter what age, should be given the opportunity to know words and to know books of most every genre. The individual imagination must be exercised to keep the mind alive. It must be driven through a sort of calisthenics to keep it strong. 2015: Certificate of Recognition for historical excellence for The Going West Pioneer Series from the Sons of the American Revolution. 2017: Recipient of the Jack London Award Presented to T.E. Watson by the California Writers Club in Oakland California, July 23rd, 2017. 2017: August - Awarded the Lifetime Membership Award by the North State Writers, Branch 21 of the California Writers Club. 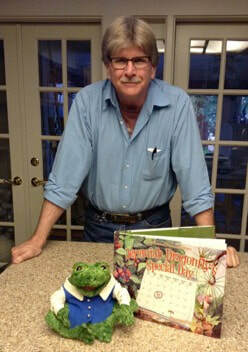 “My first introduction to children’s author T.E. Watson was in an assembly at my Elementary School in California. He captivated our students by introducing his books through his talent of creating and sharing his storybook puppets. One of my favorite books he wrote is called, "Mom, Can I Have a Dragon?" This book hooks children from the very beginning. I know that many children have a pet or wish they did and can identify with the clever story. They learn, through the written word and pictures, what it could be like to have their perfect pet.